Column: Rick Priestley, "This gaming life - Going digital"
There’s a quiet revolution going on in the worlds of fantasy and science-fiction model design. Behind the scenes, bleary-eyed chaps are staring intently at computer screens and jabbing thoughtfully at keyboards. Bitesize battle: Dan Mersey, "A wild west shootout with a difference - Bang! 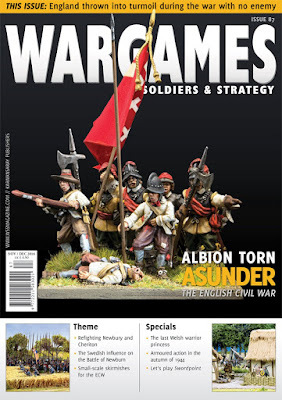 you're dead"
A small collection of Old West models is perhaps the most cost-effective ‘army’ a wargamer can own. Terrain and scenery is interchangeable – basically, once you have your cowboys painted and based, you’re good to go with any rules that hits the market. Feature: Rob Broom, "The last Welsh warrior princess - Gwenllian of the great revolt"
It is generally assumed that, with the victory at Hastings, the conquered lands rolled over and embraced Norman rule. This was not the case. For many years, opposition to Norman rule was ferocious. Wales, in particular, was a hotbed of both resistance and localized infighting between different factions. One Welshwoman, the princess Gwenllian, donned her armour and sword and, together with her sons, led an army to battle in 1136 against the Norman invader. This is her story. A Jadgpanther advances - they are great tank killers but don’t make for great tanks.Feature: Piers Brand, "Armour action in Belgium - An autumn storm"
By the end of August 1944 the campaign in Western Europe was finally achieving what it had set out to do. After wearing down the German Army in Normandy, the following German collapse and Allied advance had been so rapid that it seemed incredible to some. By early September 1944 the British War Cabinet began to look at 31 December 1944 as a possible date for the end of the war against Hitler’s Germany. Feature: Mark Backhouse, "Rediscovering your wargames mojo - Getting back in the saddle"
Feature: Tony Barton, "A sculptor's first inspiration - Nostalgia in tin"
As a teenager in the sixties, I met Les Higgins of Phoenix Miniatures, whoshowed me how he worked: he carved his figures from blobs of solder formed on wire loops (since at that time epoxy putties were unavailable). I thereafter became obsessed with making my own figur es. Theme: Eoghan Kelly, "This war without an enemy - A very English Civil War"
While much of Europe had torn itself apart in the Thirty Years War, England sat quietly to one side and had precious little involvement in mainland affairs, apart from a few expeditions in the 1620s to support the Protestant sides. However, a slow burning fuse was lit in England which would ignite a powder keg that would herald the bloodiest war in English history. It was almost exclusively fought in England and Scotland. By the time the wars ended, it is estimated that close to 10% of the entire population was dead. A Scottish column marching south.Theme: Michael Leck, "The Swedish influence on the Battle of Newburn"
‘Is he for real?’ you must think. ‘Does he really mean that the Swedes were involved in the prelude to the English Civil War?’ Finding a Swedish connection was hard but eventually I managed to find some interesting information regarding how Sweden influenced the start of the English Civil War . Theme: Mark Backhouse, "Small scale scenarios for the English Civil War"
The English Civil War is loaded with small battles that have largely gone unrecorded in the major histories. I’m fortunate to live in Hampshire, one of the counties in which a number of major battles took place. Along with Cheriton and Basing House, there are some slightly less well known major battles such as Alton and the Siege of Portsmouth. 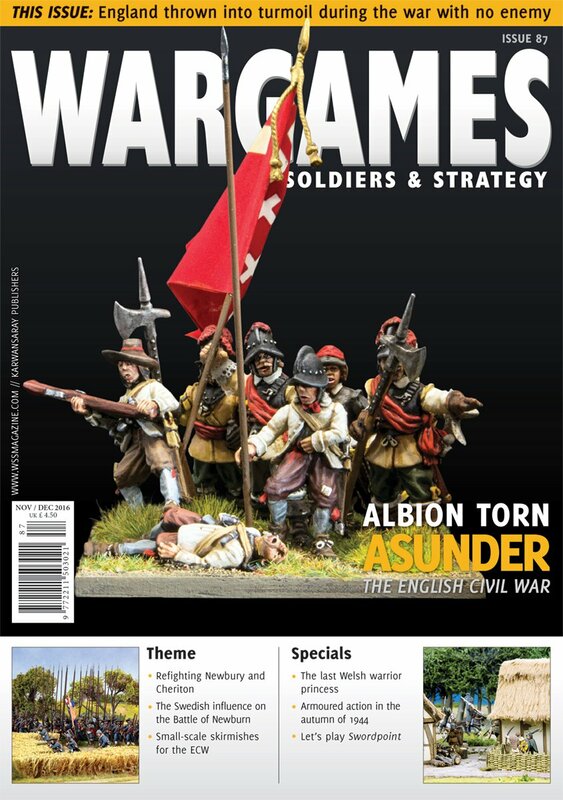 But once you delve deeper, the number of large skirmishes and small battles is pretty astonishing, many of which could provide the basis for immersive wargames. Theme: Nicholas Stock, "The Battles of Newbury, 1643 and Cheriton, 1644 - Soldierly actions in an unhappy war"
Theme: Guy Bowers, "Collecting armies for the English Civil War - For God, King and parliament"
The Three Kingdoms of England, Scotland and Ireland largely avoided the bloody Thirty Years’ War which raged in Europe, pitting Protestant against Catholic. Peace reigned over the three kingdoms throughout the first half of Charles I’s reign. However, Charles’ attempts to reform the Scottish churches led to the Bishops’ War in 1639, the Irish Rebellion in 1641 and finally the English Civil Wars in 1642-46, 1648-49 and 1649-51. Them: David Imrie, "On the cover - Death before Dishonour"
Most of us, somehow, like the poetic story of ‘The last stand’. Whether it be Custer at Little Big Horn or the 44th foot at Gandamak … all well documented in the medium of miniature painting and art. One story of a last stand that has stuck with me ever since my first visit to the Marston Moor battlefield near York is the story of Newcastle’s Whitecoats. Column: Tony Harwood, "The irregular - A labour of love or a necessary evil"
I confess I am a model maker first, a figure painter second and a gamer third! My hobby interests are varied, most of my model making being scratch-built or heavily modified from commercial products. Hobby: Tony Harwood, "Building a timber framed dovecote - The dove house"
My latest scratch built model is of a late medieval timber framed dovecote. Earlier medieval dovecotes tended to be round and made of stone. Later medieval and Tudor ones, however, were built of timber and therefore had to be square or octagonal. Such timber structures were commonly built from Tudor times through to the 18th century, when there were a recorded 26,000 cotes in England alone. Hobby: Ruben Torregrosa, "Painting snow camouflage for Kharkov - White death"
The following painting guide will show you how to paint German soldiers fighting at the Third Battle of Kharkov (in February and March 1943) using the new 28mm range from Heer46. The range was funded by a recent Indiegogo campaign and should be released for sale very soon. Let's play: Rossco Watkins, "Quick play colonial rules - The men who would be kings"
Sunday afternoons were sacrosanct growing up in our house: a roast lunch followed by a movie that my father and grandfather were more than likely to fall asleep through. But these movies were ‘the stuff’ that would capture a young boy’s imagination forever. Films about brave, noble, and loyal Englishmen, or more interestingly, the odd ‘scoundrel’ serving king/queen and country. They bravely marched against the enemies of the Empire in far flung corners of the globe, generally being ‘jolly good chaps’. Let's play: Guy Bowers, "The new big battle game from Gripping Beast - Let's play Swordpoint"
Without a doubt, there has been a trend towards skirmish games of late and perhaps a feeling that the ‘big battle’ ancient historical game of old was over. For me personally, there was only one ancients game, Warhammer Ancient Battles (WAB). It got me playing big battles, collecting armies, and even started my writing career. But then Games Workshop killed it off and with it, my ancients grand battle days seemed to be over. Review: David Davies, "Game Reviews"
In this edition of Game Reviews, David Davies takes a look at Congo and Deus Vult: Burn and Loot. Column: Richard Clarke, "Up front - Forwards or backwards"
Many years ago I had the opportunity to ask a very successful businessman what the secret of his success was; his response surprised me. “Well,” he mused, “I think it must be the realisation that if you’re not going forward, you’re actually going backwards”. Simple as it sounds, it turned out to be sound advice and, on reflection, I think that the same can be said about wargaming.